Another volatile session for US markets, but then we should expect it now that there are fewer and fewer houses running positions. The break of the psychological $50 price level in WTI oil yesterday, was one of the key reasons given for today Asian weakness. Shanghai closed the session down a little over 1% and was heavily weighed by the energy sector. However, the tech heavy Hang Seng closed the day 0.3% higher, which has probably taken the NASDAQ as its lead as that too found solid demand from fresh buying interest these past few days. The Nikkei also suffered from falling energy prices and saw a demand for the Yen. Now trading close to recent highs, the Yen is in danger of electing a 111 handle. Both the ASX and SENSEX closed almost unchanged, but were encouraged as trading off of their intraday lows. The slowing down in China is affecting the region, but probably more so the chief resources exporter – Australia. Europe was happy that Italy has managed to settle on its 2019 budget with the number accepted at 2.05%. Italian debt tightened 14bp and now trades at 2.8% for 10yr paper. The FTSE MIB gained a little over 1.5% for the day, aided by the financials sector as banks saw a healthy recovery in some of these papers. However, although the 1.6% is good for Italy it is worth remembering the index is still down over 13% for the year. The Euro found support following the Italian budget agreement and managed a gain of +0.5%, taking it to a 1.14 handle. Core European indices (CAC and DAX) have managed around a +0.4% return, but its the UK’s FTSE that saw a 1% rally today. News that GSMB (Glaxo) was to split division helped shares to rally over 5% and that helped todays FTSE performance. However, the GBP has traded heavy in comparison to the Euro’s strength and that has assisted the stock index. A strong US open ahead of the FED’s announcement has also boosted confidence for the European close. US markets saw the initial rally once again rejected, despite having traded over 350 points higher. The 700 point swing materialised following the FED Chairs comments that 2019 will see their balance sheet shrink. The turn produced new lows for the year, but more surprisingly, still only sees a small increase in the VIX index. Still the market has failed to accept that rate rises can be good for stocks. 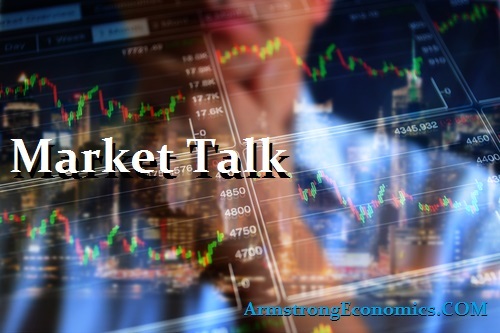 Jerome Powell spoke with an almost unchanged agenda and that their outlook remains on track surprised many as most had anticipated them changing course. The USD index keeps its bid but was probably more obvious against Sterling. The long end of the yield curve was where it was noticed most and a 10bp drop in 30’s helps flatten the curve even more. 2/10’s are now into 10bp and look to be on course to frighten many as it goes. Japan 0.03%, US 2’s 2.65% (u/c), US 10’s 2.75% (-4bp), US 30’s 2.98% (-10bp), Bunds 0.24% (u/c), France 0.70% (-1bp), Italy 2.79% (-15bp), Turkey 16.21% (-59bp), Greece 4.26% (-9bp), Portugal 1.65% (+3bp), Spain 1.38% (+1bp) and UK Gilts 1.27% (+1bp).